4,788 total window panes, which included 168,000 square feet of glass on the south, east, and west sides of the building. ADEC, Inc. had anticipated that the existing film would be difficult to remove. But, because the existing film was manufactured by 3M, ADEC could “sweat” off the old film, a process that involves heating up the adhesive to release it from the glass. It turned out to be a fairly simple process. At 62 stories, the AON Center, towering over the sweeping vistas of Los Angeles, is one of the world's tallest buildings. Built in 1974, the AON Center features windows from top to bottom. 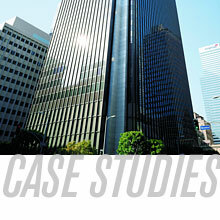 To control heat and glare, the building's management had window film applied to the glass in the late 1980s. But while the film did improve energy efficiency, most window films at that time had one serious flaw – eventually they acquired an unwelcome purplish tint. Almost two decades later, the AON Center was due for a facelift. Motivated to increase the building's energy efficiency and take advantage of new energy rebate offers, Operations Manager David Thompson called in two competing window film dealers to participate in an informal performance test. Harry Stallmach, owner of ADEC, Inc., a 3M-authorized Dealer / Applicator, and his competitor each applied film to a test area. Building engineers then measured temperatures over a two-month period. The same technology that tones down reflectivity also makes the Night Vision film color-stable, ensuring the color won't change. Preliminary results indicate that the AON Center will realize annual energy savings of more than $200,000. Combining those savings with the energy rebates, Thompson expects the project's cost will be recovered in less than two years. Other pleasing results include fewer tenant comfort complaints, positive feedback about clearer views – even at night, and a noticeable improvement in the building's exterior appearance.